Blue baby syndrome can refer to a number of condition that results in blueness of the skin in babies. A cyanotic newborn, or "blue baby". Note the blue coloration of the fingertips. A number of cardiovascular defects may lead to blue baby syndrome. The most common cyanotic heart defects include tetralogy of Fallot, persistent (or patent) truncus arteriosus, tricuspid atresia, transposition of the great vessels, and anomalous pulmonary venous connection. 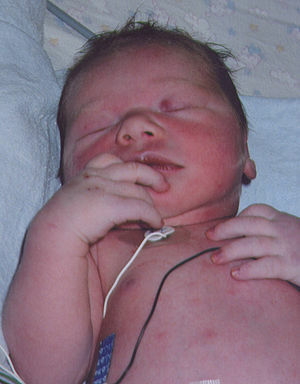 Blue baby syndrome can also be caused by nitrates in drinking water leading to methemoglobinemia. Nitrates from polluted drinking water form compounds in the body that change haemoglobin to methemoglobin, decreasing the ability of blood to carry oxygen. In infants, the condition can be fatal. The sources of nitrate can include fertilizers used in agricultural lands, waste dumps or pit latrines. For example, cases of blue baby syndrome have been reported in villages in Romania and Bulgaria, and were thought to be caused by groundwater polluted by nitrate leaching from pit latrines. Nitrate levels are subject to monitoring to comply with drinking water quality standards in the United States and other countries. The link between blue baby syndrome and nitrates in drinking water is widely accepted, but some studies indicate that other contaminants, or dietary nitrate sources, may also play a role in the syndrome. Other insults in neonates, such as respiratory distress syndrome, can also produce a "blue baby syndrome". Like methemoglobinemia, these are not structural lesions and are not regarded by most doctors as true "cyanotic lesions." ^ a b Hamby, Alfred S. (2010). Three Brothers Plus One Book VI Medical/Surgical: Investigations of Medical Crimes and Other Crimes against Medical Society and Establishment. p. 158. ISBN 9781453578186. ^ "Water-related diseases". WHO. Retrieved 14 February 2019. ^ "Blue Baby Syndrome". Retrieved 24 March 2008. ^ Sims, Judith, L. "Blue-Baby Syndrome". www.encyclopedia.com. Retrieved 14 July 2018. ^ "What is Blue Baby Syndrome?". wiseGEEK. Retrieved 14 July 2018. ^ Majumdar Deepanjan. "The Blue Baby Syndrome". Resonance. 8: 20–30. doi:10.1007/BF02840703. ^ "National Primary Drinking Water Regulations". EPA: United States Environmental Protection Agency. Retrieved 14 July 2018. ^ "Water-related diseases". World Health Organization. Retrieved 14 July 2018. ^ Fewtrell, Lorna (22 July 2004). "Drinking-Water Nitrate, Methemoglobinemia, and Global Burden of Disease: A Discussion". Environmental Health Perspectives. 112 (14): 1371–1374. doi:10.1289/ehp.7216. PMC 1247562. PMID 15471727. ^ van Grinsven, Hans JM; Ward, Mary H = 2006 (2006). "Does the evidence about health risks associated with nitrate ingestion warrant an increase of the nitrate standard for drinking water?". Environ Health. 5 (1): 26. doi:10.1186/1476-069X-5-26. PMC 1586190. PMID 16989661. ^ Ward, Mary H.; deKok, Theo M.; Levallois, Patrick; Brender, Jean; Gulis, Gabriel; Nolan, Bernard T.; VanDerslice, James (23 June 2005). "Workgroup Report: Drinking-Water Nitrate and Health—Recent Findings and Research Needs". Environmental Health Perspectives. 113 (11): 1607–1614. doi:10.1289/ehp.8043. PMC 1310926. PMID 16263519.